The conclusions of all three studies got me thinking. According to the physiologic principle known as Davis’s law, all connective tissue (including ligaments) organizes its cellular structure to resist the stress under which it is placed. So a UCL under stress would naturally begin to thicken, making it more robust and able to resist the extreme valgus stress of high level throwing. When that stress is applied too rapidly – faster than the ligament can adapt – tissue failure may occur. And when connective tissue is subjected to intense stress over a long period of time, the body ultimately lays down the precursors to the hardest structure it can muster – bone. This process first manifests itself in the form of calcium deposits in the ligament, tendon, or muscle under duress, or in spurring off the end of a bone. The tone of the article suggests that early ligament thickening is a bad thing that could increase risk of failure later. But I was a bit perplexed by this supposition. I fired off an email to my friend, Dr. Ed Fehringer, an Orthopedic Surgeon from Omaha, Nebraska who specializes in shoulder and elbow surgery. Need your guidance on something. According to Davis’s Law, connective tissue remodels itself to resist the demands of stress applied. In my view, ligament thickening without calcification is probably a natural adaptation to higher throwing volume and should actually decrease the risk of tissue failure as long as the thickened ligament remains organized. The current paradigm in orthopedics appears to be to label all throwing injuries as “overuse”, and thus the treatment approach is to reduce stress. Without stress there is no adaptation, so reducing it might actually be more risky. The key, as I see it, is to manage the stress. If we don’t push enough, we don’t get adaptation. If we push too fast, we get tissue failure. If we push too often or for too long, we get calcification. “Hi Randy. Thanks for your note. IMO, you are spot on. I would expect they’d find thickened ligaments. They should….just as the dominant arms of tennis players are larger….and on and on. Just because two things are associated does not mean there is a cause/effect relationship. The reflexive response to the increase in the injury rate among young pitchers seems to be to take a reductionist approach. Minimize exposure, simply movements, and eliminate all stress. But according to Davis’s Law, eliminating stress completely won’t solve the problem. On the contrary. Eliminating or reducing stress significantly might make the situation worse. Managing stress and adding it slowly over time… that is the Holy Grail. So how do you know how much stress is too much? Well, that depends on the player… and that requires an assessment. Each guy is different. You have to know exactly where the athlete is on the spectrum of development, workload, and stress at all times. 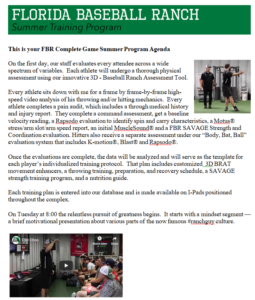 Only then can you prescribe an appropriate training plan customized for that player. We’d love to conduct an assessment on you and help you come up with just the right training plan… But you gotta get here! If you aren’t sure if you’re applying too much or too little stress… if you’re progressing too slowly, or too quickly, give me a call at 866-STRIKE3 (1-866-787-4533) and let’s get you signed up for an Elite Performers Boot Camp. We’ll conduct a full head-to- toe physical assessment and a high-speed video analysis of your throwing pattern. We’ll identify all the physical and biomechanical constraints that might be contributing to arm pain, putting you at risk for injury, negatively impacting your command and your secondary stuff, and robbing you of velocity optimization. You’ll leave with a taylor-made multidimensional plan that is sure to turn you into a coveted, durable, nasty rocket man. Our final 2 camps of the season are scheduled for Jan 21/22 and Feb 11/12. This will be your last chance to get engaged and locked in before the spring season. Our next camp won’t be until late May or early June. Otherwise, call us at 1-866-STRIKE3 (866-787-4533) and we’ll get you set up. 1. Atand A Jr, Averill LW, Wallace M, Niilker TA, Nazarian LN, Ciccoti MG. Factors Related to Increased Ulnar Collateral Ligament Thickness on Stress Sonography of the Elbow in Asymptomatic Youth and Adolescent Baseball Pitchers. Am J Sports Med. 2016;44 (12):3179-3187. 2.Atanda A Jr, Buckley PS, Hammoud S, Cohen SB, Nazarian LN, Ciccotti MG. Early anatomic changes of the ulnar collateral ligament identified by stress ultrasound of the elbow in young professional baseball pitchers. Am J Sports Med. 2015;43(12):2943-2949. 3.Ciccotti MG, Atanda A Jr, Nazarian LN, et al. Stress sonography of the ulnar collateral ligament of the elbow in professional baseball pitchers: a 10-year study. Am J Sports Med. 2014;42:544-551.